Whether you want to increase your effectiveness at work or you simply want to improve your daily decision making, 7 Strategies provides insights into how the brain effects your thoughts, and how you can make it perform better. 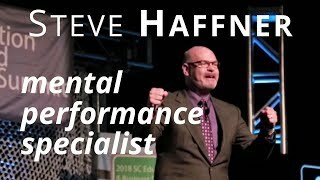 Steve Haffner provides audiences with insight and intrigue through compelling programs that improve mental performance and decision making. Steve enjoyed a 30 year corporate career with EDS, William M Mercer, and Humana among others. In his roles as a systems engineer, project manager, business analyst and vice president, he experienced firsthand the effects of subconscious influences on decision making by executives, managers, administrators and staff. In 2011 Steve launched his own business as an entertainer and speaker, performing provocative and astounding programs that explore the human mind and its hidden mysteries. Drawing from the fields of psychology, neuroscience and behavioral economics, Steve studies how the primitive part of the human subconscious – the lizard brain - affects our behavior and decision making. This leads to fascinating insights on how professionals' effectiveness can be subverted by their own mind's shortcuts, biases, and impulses. Steve's mantra, "Confront the Lizard," is a call for all of us to take a moment, think instead of react, and recognize the situations where the lizard brain subverts our conscious decisions. Through this awareness we can ensure that our decisions align with our personal and professional goals and reflect our values. Steve's keynote and workshop programs on mental performance are engaging, informative, motivational, and intriguingly entertaining. He pulls from his own experiences in both corporate management and mentalism (entertainment) as well as scientific research to explore how we can improve our decision skills, productivity, and relationships. Having excellent decision making skills, including the ability to overcome subconscious lizard brain influences, is vital to effective leadership. This unique program teaches attendees to how to recognize and challenge their own subconscious impulses and preferences. Creating and maintaining an effective office or work environment requires decision making that aligns with your organization's goals and reflects its values. This intriguing program explores the natural unconscious tendencies that can subvert a positive and productive workplace. We each have the potential to be amazing, but often fall short and beat ourselves up in the process. In this motivational and entertaining program, learn from a former professional magician how to discover your amazing hidden talents so you can live your values and become the best possible version of you. Mentalist Steve Haffner wows audiences with mind bending, interactive demonstrations of psychological illusion. When you want everyone at your event to have a blast, Steve's corporate entertainment program is a great way to see that through. The Virtual Mind Reader program offers a uniquely compelling blend of intrigue, comedy and mind magic. Whether it's by predicting audience members' actions, subliminally influencing their decisions, detecting lies or reading their minds, Steve ensures that your attendees will be engaged, intrigued, and amazed! They will love the audience participation and universal appeal of Steve's intelligent and clean performance, and they will surely be asking themselves "How did he do that?!" long after the show has ended.